When we moved into our house, every wall was white. Well, not white. Kind of a french-vanilla-off-white. Everywhere. French. Vanilla. A few months ago, I decided that we had to have color, somewhere. I figured I’d start with the kids’ room. Kid’s rooms shouldn’t be white. If for no other reason than because it’s too evocative of a blank sheet of paper. I decided that I wanted to paint most of the room a powder blue and – the fun part – do a section of the wall with chalkboard paint. 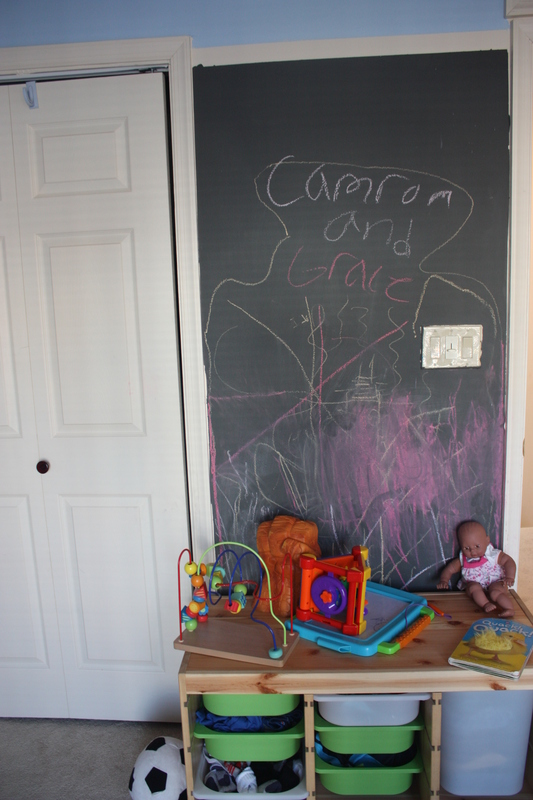 At the time, I knew nothing about chalkboard paint except that I’d seen some pictures of rooms with it online and thought it looked awesome. It was very easy to do, even for someone who had never tackled a self-done home improvement project like me. I went to Home Depot and got a 29 oz container of Rustoleum chalkboard paint. The jar had the words “tint base” on it. That’s because there are a few colors you can use when painting your chalkboard. I know red and green were some options. I went with slate grey because I wanted a classic chalkboard look. Then, I just taped off where I didn’t want the paint to go — that beige square was a light switch, I also created a little border — and started painting. I needed about three coats. Also, it needs to set for a few days before you use it. Brown people! Who knew it was so hard to find them in kids’ books? I get kind of angry black woman over my children seeing people who look like them in the books they read and the tv shows and movies that they watch. I just think there are so many ways mainstream culture can ignore people of color, that I need to do everything I can to provide a counterbalance. Maybe a year ago, I went to Barnes and Noble looking to get my kids some new books. The store I went to had a pretty big kids’ section, but as exhaustive as it was – I had a difficult time finding books featuring black people. Granted, I was with Cameron and Grace, which meant that I was spending a good amount of time making sure no one fell/died/put anything in their mouths, but I really struggled to find books that represented anything other than the blonde-haired, blue-eyed norm. Eventually, I got mad and picked up some books staring dinosaurs in protest. Anyway, we do have some good books starring minorities that I thought I’d share with you. In case you ever happen to be in the same predicament. The Snowy Day and Peter’s Chair by Ezra Jack Keats- These are classics and the artwork is gorgeous. I actually did purchase our copies from B&N. Feast for 10 by Cathryn Falwell – Every member of the family in this story looks like Oprah! It’s true! A Target purchase. Sing Along Song by JoAnn Early Macken. Got this from a small discount store in Baltimore which has since closed, but I think you can still get ’em from Amazon. Please, Baby, Please by Spike Lee and Tonya Lewis Lee – Cameron and Grace looove this book. See also – realistic depiction of adorable natural hair. Originally ordered this from Amazon in paperback. After Cam did away with that, got a sturdier copy from Target. If I Was Ten by Pierre Bennu – I am lucky enough to live near natural hair product store Oyin Handmade, which is owned by husband and wife team Pierre and Jamyla Bennu. If you’re not so lucky, but still interested, they’re available for order here. 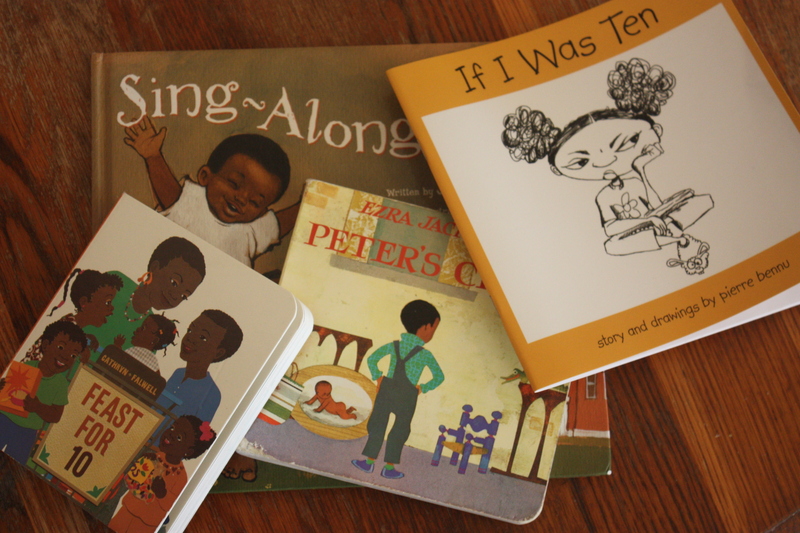 I’m always looking for good kids’ books, especially those featuring all minorities – know of any others?